Revamp commercial lighting design with the stylish 16" Barn Light Shades. Featured here on a straight gooseneck arm, this fixture makes an attractive light for signs, storefronts and awnings. Display gooseneck lights in multi-fixture arrangements for a cohesive look and brilliant illumination. Each outdoor commercial light is made from aluminum with a powder coated paint finish. 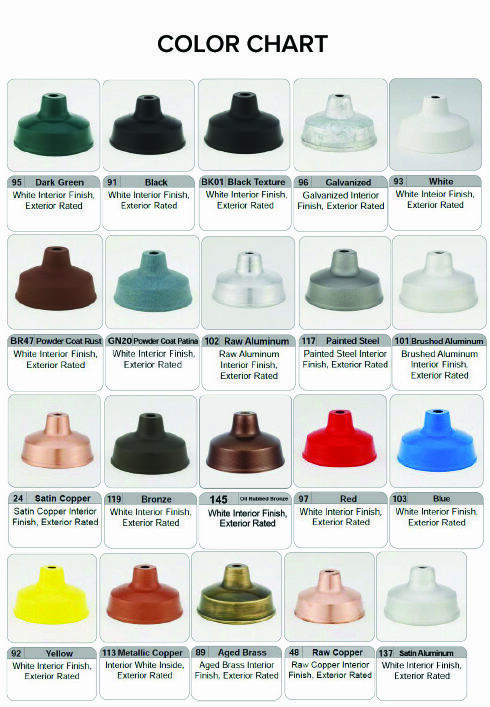 Powder coating is rust resistant and available in 25 vibrant colors. Get Barn Shade Goosenecks online with the standard incandescent lamping or upgrade to a choice of compact fluorescent (CF) and metal halide (MH). Other high-intensity discharge (HID) gooseneck lights are also available by request, or energy efficient LED's. Please call toll free for details. The 16" Barn Light Shade is ideal for large commercial signage and exterior lighting projects. Each outdoor-rated fixture comes with an aluminum back plate that has mounting holes fitted to installation on any standard 4" junction box. This commercial-grade light is wired for a maximum 200W incandescent bulb. Maximum wattage and ballast options will vary per lamping. Gooseneck lights are UL Listed for exterior use (US and Canada).